The brushtails Kiki, Toto, Sasha, Farley and Comet and the ringtails Wasabi, Tilda and Ruby have all been visiting. At one stage a young ringtail, who is probably Ruby's baby, visited but didn't stay long and hasn't been seen since. 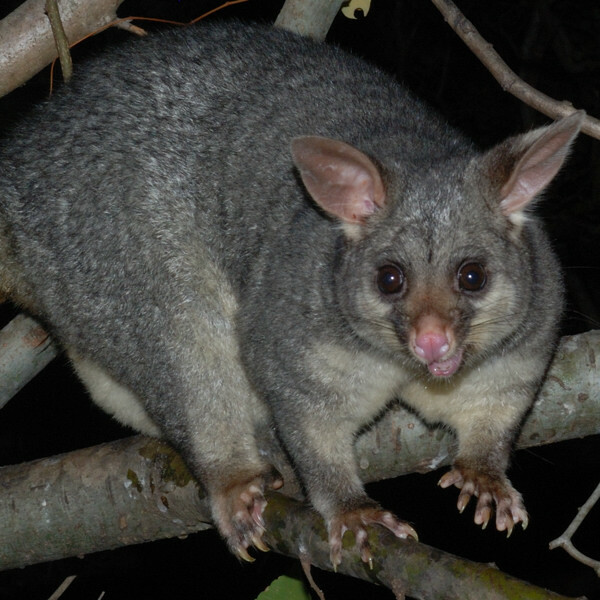 All of the female possums, including even Toto, have babies in their pouches. Sasha's is the furthest along and we might see parts of it sticking out of the pouch within the next few weeks. 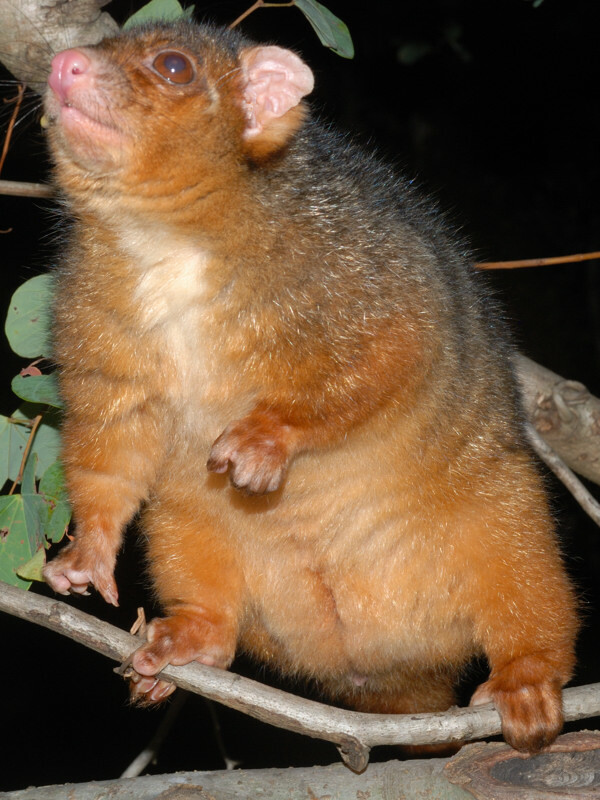 The Ceiling Possum is still around and is still yet to be identified. Tilda has been piddling less on the handrail. This may be because she gets denied any food when caught piddling. Farley continues to be an annoyance to other possums. He has been seen to attack ringtails in the feeding area. 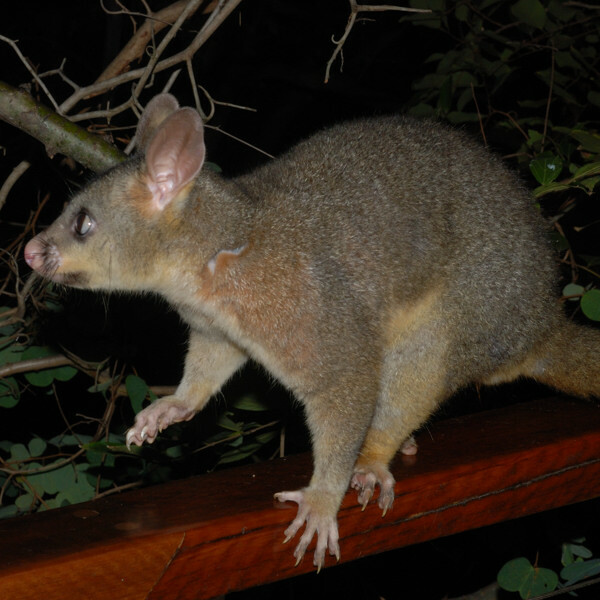 He chases away Comet whenever he sees him, and harasses all of the female brushtails. Female brushtails rank higher in the pecking order than males, so Farley often gets shrieked at by Toto (Toto can let out some murderous shrieks, which must make the neighbours wonder what's going on over here) and chased by Sasha. Kiki is fierce enough that she only has to glare at him and he runs off, making "tfff-tfff-tfff-tfff" placating sounds. 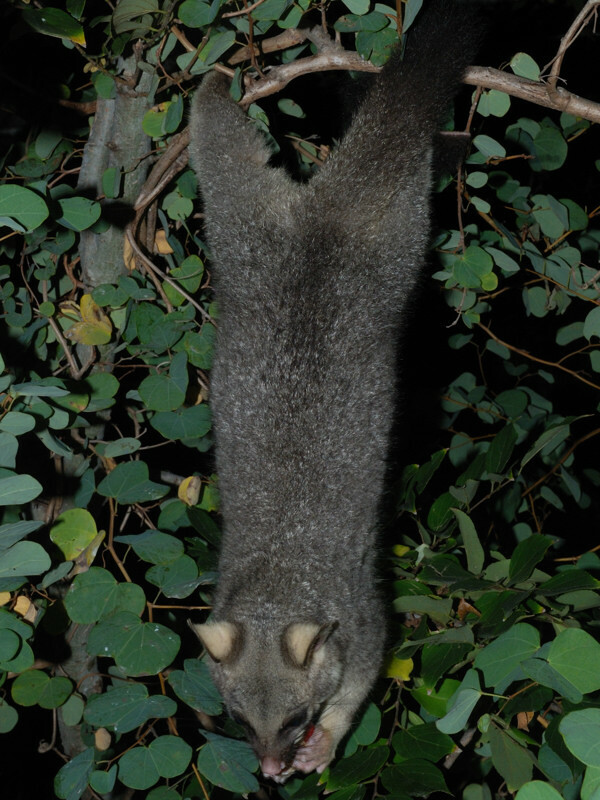 Sometimes other possums must catch up to him because he is often seen with minor pluckings, like the one on his neck in the photo above. Toto's injured leg is now better, or at least she now seems able to use it without difficulty. 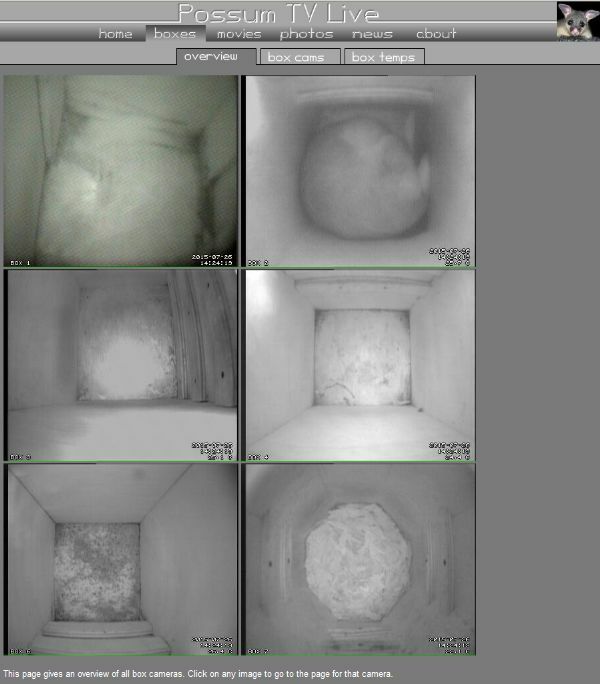 There have been some changes made to the Possum TV Webcam site; a new Box Camera Overview page has been added. This displays images from all six (working) cameras simultaneously. This is intended as a convenience for visitors; rather than having to tediously step through the individual box camera pages one at a time to check if any box is occupied, you can now just glance at the Overview page. I was motivated to build this page after a visitor actually went to the trouble of creating a page like this for their own use. The overview page is currently fixed at a 5 second update rate to conserve bandwidth and isn't really intended for watching possums in their boxes (although you can use it for this purpose if you want). If you're watching a possum in a box, it's better to go to the individual page for that box, where you can do extra stuff like select a faster update rate or take snapshots etc.